713 Park Street, also referred to as the Judge Watson House, is a historic structure in the North Downtown neighborhood. In 1861, Judge Egbert R. Watson, who read law under James Monroe's son-in-law Judge George Hay and was a personal friend of the former president, purchased 2 3/10 acres from Richard K. Mead. The lot was off the southern side of his Meadlands estate. 1862 tax records show an assessment of $500.00 for improvements on Watson's property. 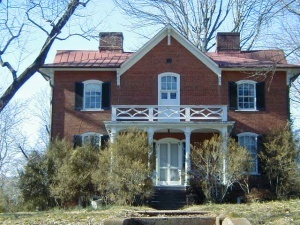 In that same year an addition was constructed on the west side of the house. Judge Watson resided here until his death in 1887. During the Civil War a northern colonel and his orderly resided in Watson's house. Judge Watson's heirs conveyed the property to George Rives in 1887. Upon George Rives' death in 1903, the house passed to his widow Sallie. It became the Episcopal Rectory in 1919. In 1971, the Trustees of Christ Episcopal Church sold the house to Mr. and Mrs. William Isaccs for $38,000. The Romberger Corporation purchased the house for $876,500.00 in 2006. 2018 City tax records show an assessment value of the improvements at $741,900, with a total value of $1,025,700.00 for the land and improvements. George Hay, William Wirt, and Gordon MacRae formed the team of prosecutors for the government at the Aaron Burr Treason Trial of 1807 in Richmond, Virginia. Charge against Burr, former vice-president serving during President Thomas Jefferson's first term, was treason against the United States.